What Would It Take to Change the Way Postmodern Societies Work? My political imagination in the early 1980s could fairly be said to have been primed by feminist sf of the 1970s. But although representations of feminist revolution and utopia excited me, after a time they began to frustrate me, too. How, I wondered, could we get to "there"—i.e., a desirable situation in which to live, boasting a viable, vibrant polity and a minimum of hardship and suffering for the many rather than the few— from "here," viz., our current political reality of plutocracy and a savagely exploitative capitalism that ensures widespread misery, deprivation, and constriction of people's lives? The question haunted me. Feminist sf offered me a few stories about revolution, many stories about fairly good places, and a lot of stories about really bad places. But like the bad places, those good places existed chiefly to offer us a lesson in what was wrong with our world, combined, maybe, with a little indulgence in wish-fulfillment. And images of revolution tended to skip the long hard process of collective change that sustained creation of a different world must in reality entail. History, after all, has repeatedly shown that neither regime-change nor even form-of-government change alone will remake the world. I wanted a more direct, explicit vision of how it might be possible to change human thinking as well as social and political interactions; I needed to believe that a world in which the thriving of human life in every case supersedes the profit motive is theoretically not only possible but also achievable—without having first to start from a post-holocaust slate wiped clean of recent human history. I decided that I would begin from a dystopian baseline to keep my experiment from becoming an easy fantasy of wish-fulfillment (and also because three and a half years of the Reagan Administration had made me pessimistic about future life in the US). 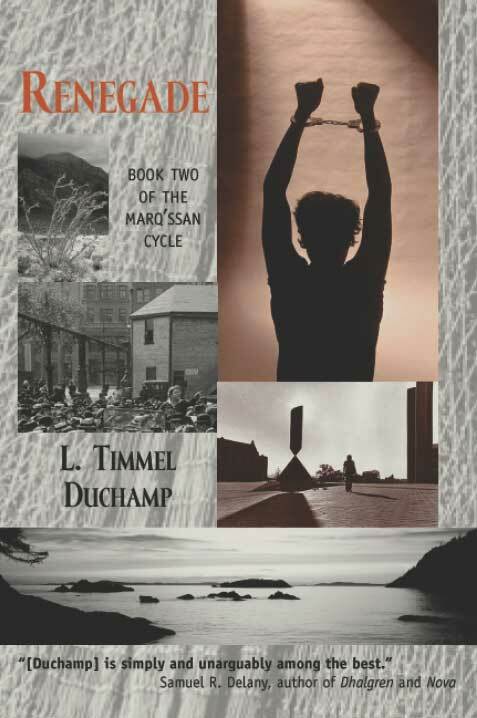 And so in October 1984, I sat down and began writing the Marq'ssan Cycle, a series of five novels totaling roughly one million words: first Alanya to Alanya (October—November 1984); then Renegade (December 1984—April 1985); Tsunami (June—September 1985); Blood in the Fruit (October 1985—February 1986); and finally Stretto (March—July 1986). During the composition of the third and fourth books (Tsunami and Blood in the Fruit), I worried that the difficulties of imagining the creation of lasting, desirable change might be insuperable. Still, I had noticed early on that each book in succession had radically altered my understanding the previous books. In the course of writing the final book, Stretto, forced to stop and reflect at length on this pattern of continual re-visioning, I grasped that I simply hadn't realized that the desired change was a process already at work in the series, one that could only become visible through this other process of constant re-visioning. When I finally finished writing the fifth book, I found that my first reader, Kathryn Wilham, had independently come to understand this, too. She told me that she could see where, if I had decided to write a sixth book, it would have had to go. The series, she said, is finished. You can trust that any reader who has been able to read through to the end will have "gotten" it. In other words, the experiment did not only require that I, the author, envision and depict the process of change, but it also required that the series' readers' very activity of constantly revising their understanding of what had gone before be the vehicle for their being able to imagine and comprehend the process themselves. 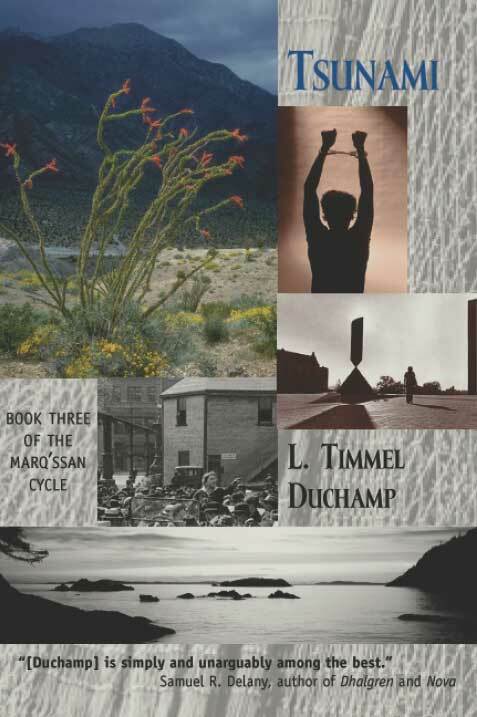 "The 2010 James Tiptree Award jury wishes to extend a special honor to L. Timmel Duchamp's Marq'ssan Cycle, noting the importance of this stunning series, which envisions radical social and political change. 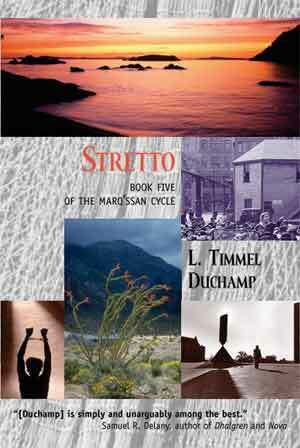 Published over a period of four years, this five-book series began with Alanya to Alanya (Aqueduct Press, 2005) and concluded with Stretto (Aqueduct Press, 2008). " 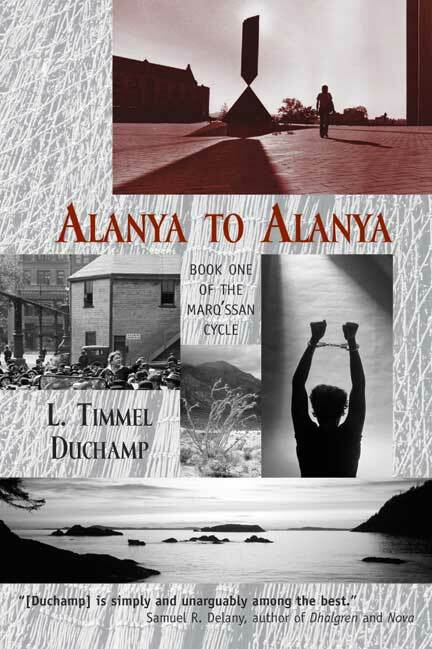 "After reading the thousands of pages in L. Timmel Duchamp's five-volume Marq'ssan cycle (Alanya to Alanya, Renegade, Tsunami, Blood in the Fruit, and Stretto, following decades of changes across the world in both large-scale politics and the everyday interpersonal beauties and violences of individual lives, you don't emerge quite the same as you were when you went in. "Gender is a central focus, as we experience a very gender-segregated society largely from a female point of view and occasionally from that of a post-gender alien species. But any separation of one of the cycle's themes must necessarily be a shallow depiction of what it is like to read these novels. "Some readers will focus most on the story of human engagement with an utterly different alien race, determined to alter the course of human politics yet determined to be something other than colonizers. Some will be most fascinated by the tale of the Free Zones, anarchist enclaves where co-operative, anti-authoritarian politics develop over decades in the US and elsewhere. These communities are not utopian but are filled with conflict and occasionally violent, yet they remain optimistic nevertheless. 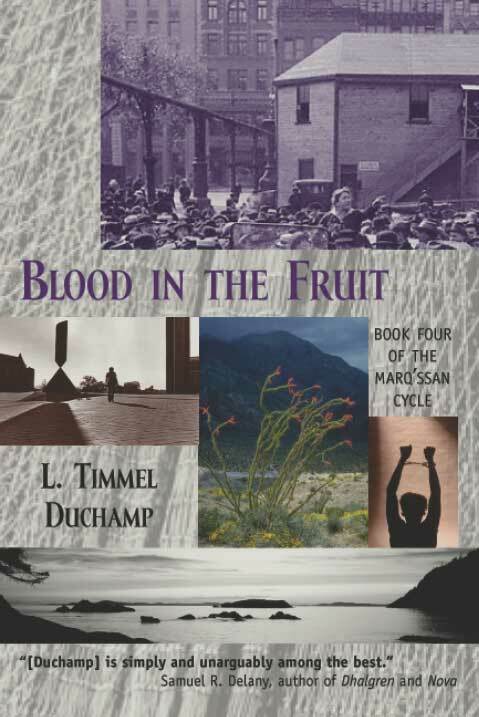 For other readers, the most memorable aspects of the cycle will be the near-future dystopian image of an intensely class-divided United States, with its startlingly prescient depictions of torture, imprisonment, and political violence, told with an unsettling understanding of the oppressors' perspective and yet never without losing sympathy for the victims. And for yet more, it will be on the level of character that Duchamp's work inspires: her many point of view characters—almost all women—whose personal and political transformations, power-laden interpersonal, frequently sexual relationships, and critical analyses of the world, drive the many intersecting narratives." "...[T]he presentation of the intimacies of power is consistently compelling. "The books have been praised by other science fictions writers including Samuel Delany and Cory Doctorow, and have been compared to work by HG Wells, George Orwell, Ursula Le Guin, Joanna Russ, and James Tiptree, Jr.
Seattle, February 2076. The The Marq’ssan bring business as usual to a screeching halt all over the world, and Professor Kay Zeldin joins Robert Sedgewick, US Chief of Security Services, in his war against the invaders. Soon Kay is making rather than writing history. But as she goes head-to-head against the Marq'ssan, the long-buried secrets of her past resurface, and her conflicts with Sedgewick and Security Services multiply. She faces terrifying choices. Her worldview, her very grip on reality, is turned inside out. Whose side is she really on? And how far will she go in serving that side? 2077. The Pacific Northwest Free Zone may be a haven from the Executive's civil war, but it seethes with division and power struggles and is subject to paramilitary covert action teams working to destabilize its civil order. The formidable Elizabeth Weatherall, now running Security Services, is determined to capture renegade Kay Zeldin, who boldly ventures outside the Free Zone in search of dozens of missing scientists. When the two women come face to face, each risks all she has become in no-holds-barred, mortal combat. Spring 2086. In a world recovering from war, the Free Zone's Co-op, beginning to extend its influence outside its borders, faces a crisis within when ugly, long-buried secrets are dragged into the painful light of day. In the US, the Executive, now reunited, turns its attention to reconsolidating the power it has lost to regional warlords, even as popular discontent with executive rule spreads. October 2086. The US Executive, seriously losing ground, resorts to desperate measures. A flood of renegade executive women establish a high-security fortress inside the Free Zone. Are they a threat to the Free Zone, or will Free Zone activists subvert them? And what, really, are they up to? 2096. The Free Zone is stable and thriving, while in the US, the career-line women who have taken over the Executive attempt to enact a reformist, liberal agenda. Can their liberal policies hold the line as a new wave of activism sweeps the US and the barriers between the Free Zone and the US begin to crumble?